Examining marine life in sein net. We call searching the Internet surfing. But, we call searching a net that’s been in the surf, seining. Seining is dragging a long net through the water, catching small fish and aquatic animals. Hans Haglund is superintendent at Galveston Island State Park. He says the bay waters are teaming with all kind of life. And he’s taken more than a few visitors seining in Galveston Bay. 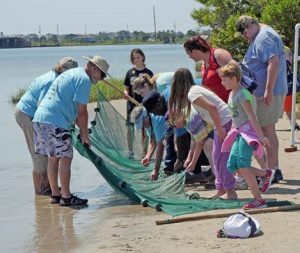 We do it to help educate about the bay, the wetlands, the environment out here; to show people how important they are, how productive they are, what these areas do for us, why we might need to protect them and look out for them. Abundant, healthy wetlands can help to mitigate potential flood damage, as well as serve as nurseries for marine life. Haglund describes visitor reactions to what they catch in their seine nets. Oh, I never know that was out there, and I never knew you could get so much in a little area. Even people that have been using the bay a lot – a lot of fishermen – don’t realize how productive these areas are. Some of the more unusual fish Haglund says they see include the pipe fish and lizard fish. Summer’s here, and Galveston Island State Park offers a great coastal getaway. Learn more at texasstateparks.org. The Sport Fish Restoration Program supports our series…and works to increase fishing and boating opportunities in Texas. This entry was posted on Tuesday, July 10th, 2018 at 12:00 am	and is filed under Education, Saltwater, SFWR, Texas Aquatic Science Program, Water. You can follow any responses to this entry through the RSS 2.0 feed. You can skip to the end and leave a response. Pinging is currently not allowed.